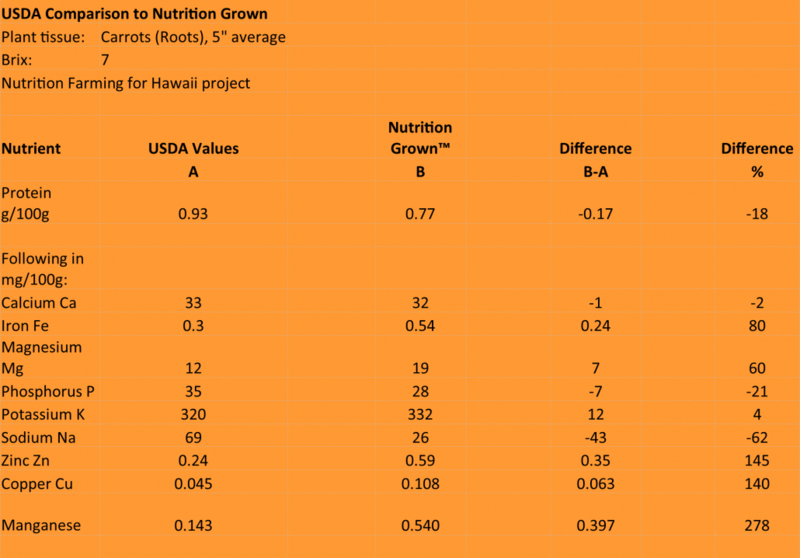 Nutrition Farming for Hawaii (NFH) is a grant-funded research and demonstration garden project, which also provides food to the community. 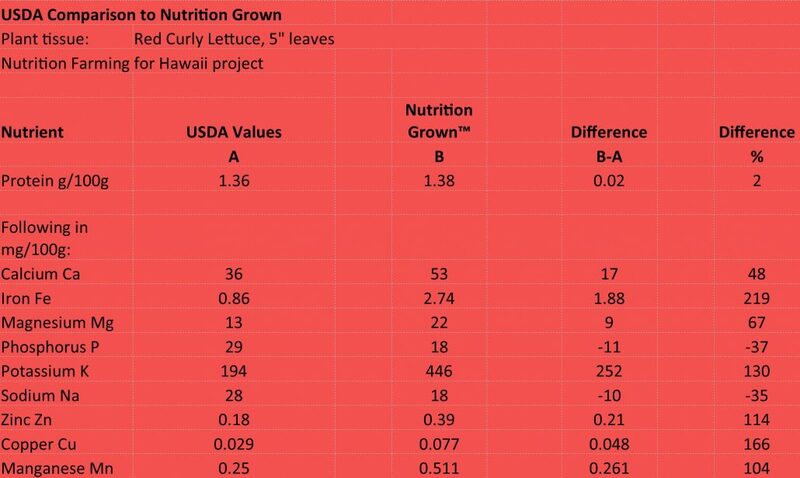 The aim is to demonstrate how food nutrient content is affected by soil health, show these parameters can be improved, and disseminate the information. The overarching goal is to improve human health and raise environmental awareness. 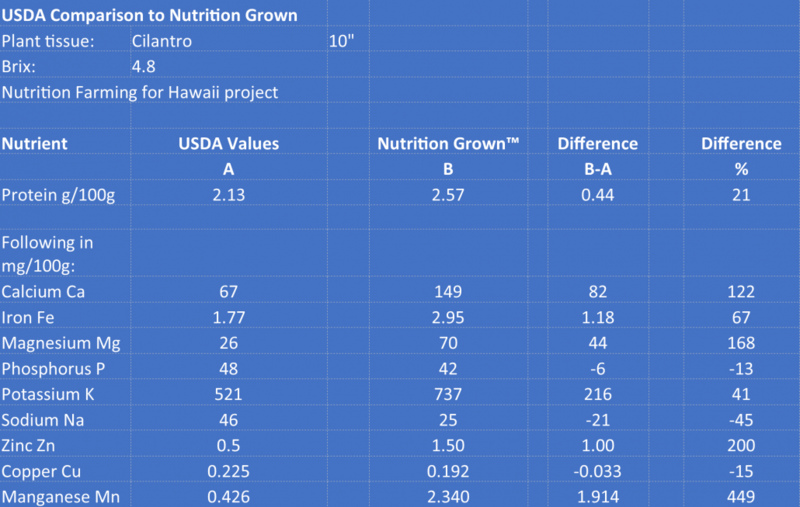 The NFH project is led by Dr. Jana Bogs in collaboration with Hawaii Institute for Pacific Agriculture (HIP Ag) who provide land and much labor. 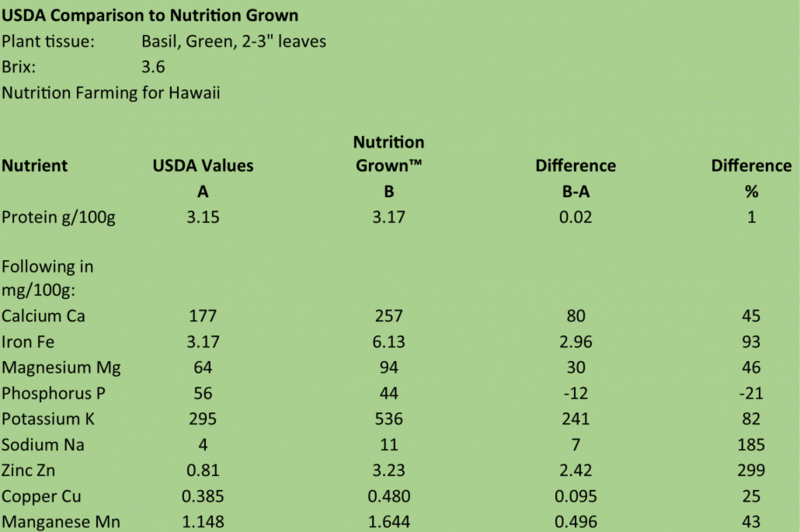 Dr. Hector Valenzuela, a full professor and Hawaii statewide Vegetable Crops Extension Specialist at the University of Hawaii at Manoa, is in the role of advisor. The project was started in 2017 on soil that had been fallowed to pasture for approximately 40 years. Before that, it was in conventional sugarcane production for about 100 years. The soil was re-analyzed in the fall, six months after the soil amendments had been added. These analyses were compared and summarized in a chart below. In addition, soil microbial life had multiplied to 15 times the original number. Please note that soil improvements, and hence plant tissue improvements, take place over a period of years. We were pleased with the progress achieved in this, our first year. 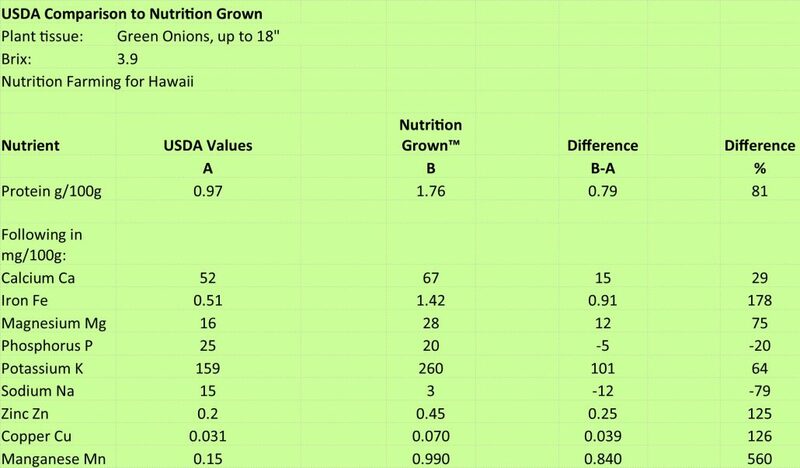 Overall, the Nutrition Grown™ crops contain close to double the nutrient content as compared to the USDA database values. We were especially pleased to see improved levels of nutrients, like calcium and zinc, which are often lacking in human diets. In the end, it is all about achieving the right balance of nutrients, not just “more”. 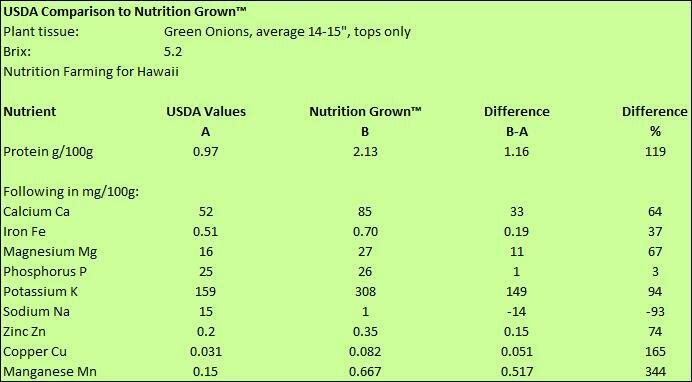 Some items, such as phosphorus, were at lower levels in our Nutrition Grown™ foods than in the USDA chart. Phosphorus is rarely lacking in human diets, so we are not as concerned about the lower levels. 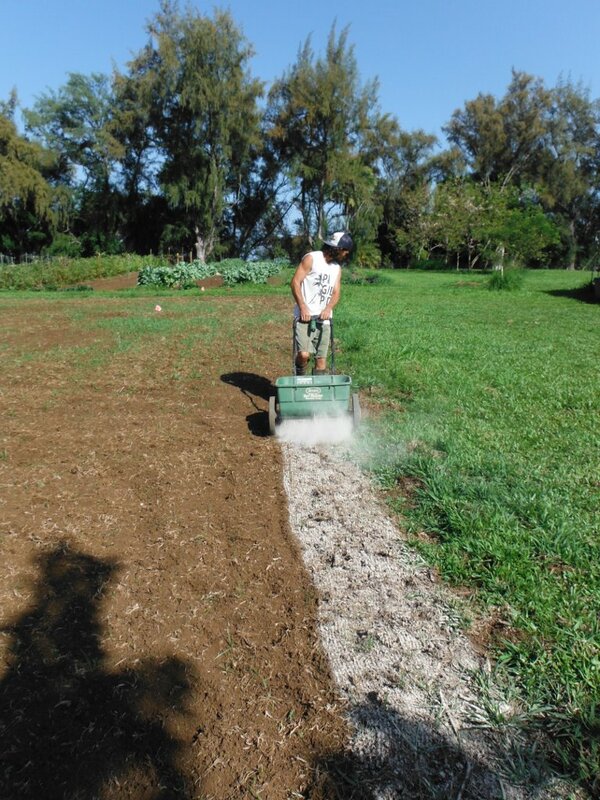 The soil had very low levels of phosphorus and we did add some soft rock phosphate, an organically-acceptable form which comes available slowly in the soil. 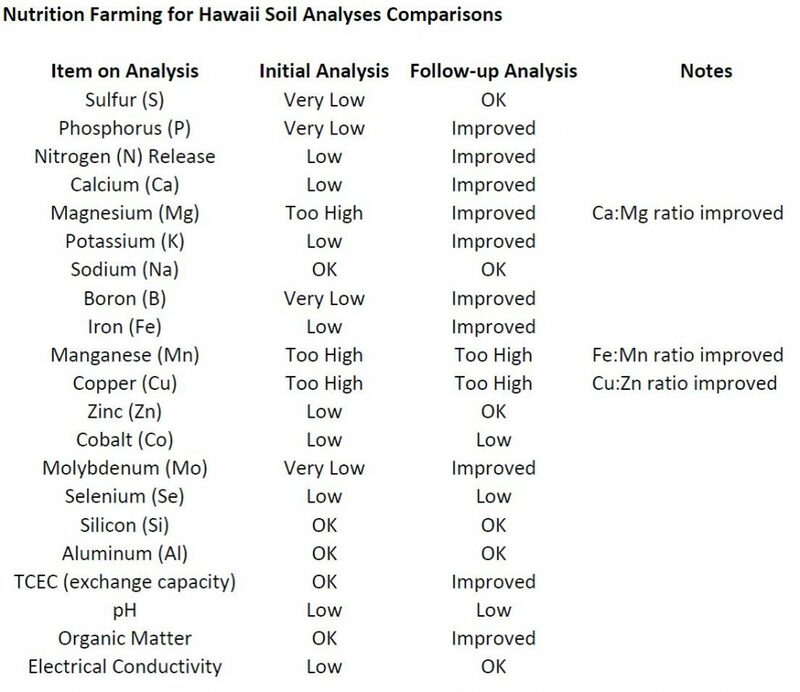 We will be adding more phosphorus in the future, especially since Hawaii soils tend to tie up phosphorus, making it unavailable to the plants. Getting the soil right takes some time! 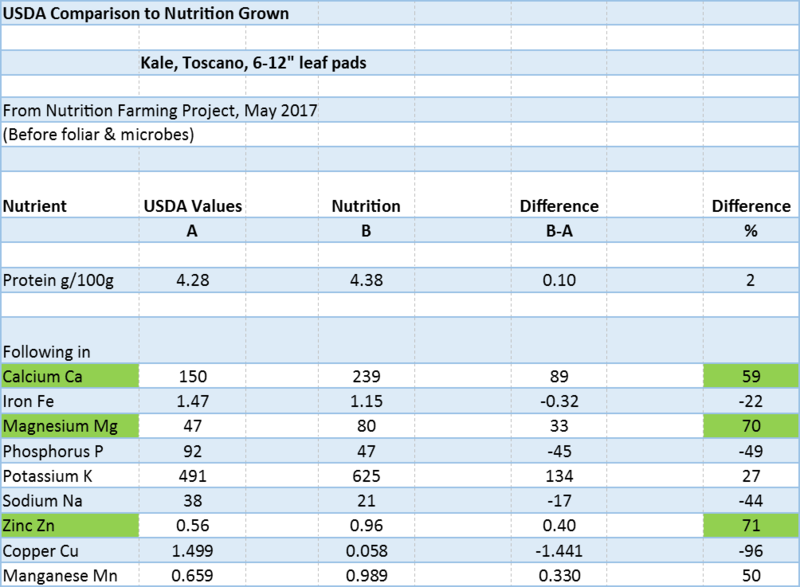 We shared our progress throughout the year on the BeyondOrganicResearch.com blog and in local newspapers, including a front page article (below), as data became available. Dr. Bogs presented the project formally to HIP Ag interns in September and at the Third Thursday Thrive meeting in October. 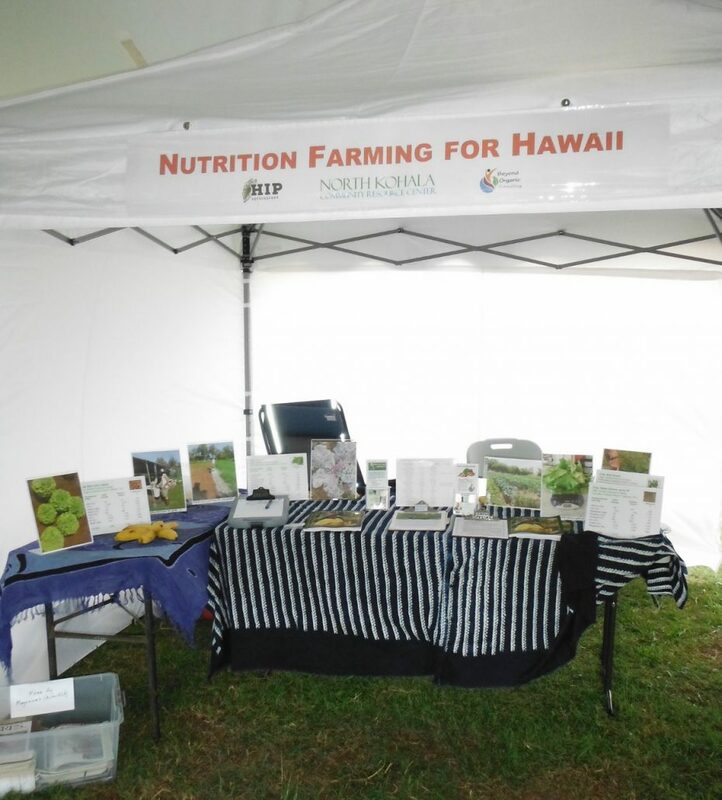 Nutrition Farming for Hawaii booths gained attention at both the well-attended `Aina Fest and the Nuts Festival in Kona. It is with much heart-felt gratitude that we thank our grant-making foundations for fully funding our project in 2017. We also thank our fiscal sponsor, the North Kohala Community Resource Center, a 501(c)3 non-profit organization, for helping us through the process of grant-finding and administration. We are seeking funding for 2018 to continue our work. If you love what we are doing, please consider a tax-deductible donation of any amount–click here. 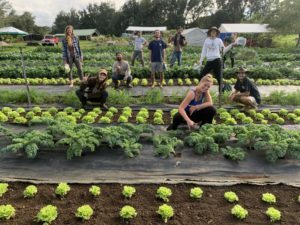 Nutrition Farming for Hawaii (NFH) had a successful second year with the research and demonstration garden, which also provides food to the community and the Farm-to-School Program. 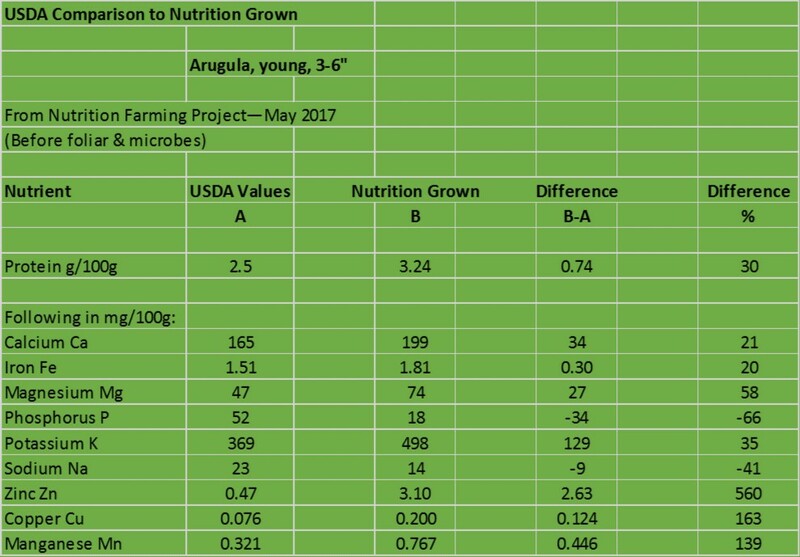 Our aim is to demonstrate how food nutrient content is affected by soil health, show that these parameters can be improved, and share the information gained. The overarching goals are to increase the quality and quantity of locally-produced foods through educational means, improve human health, and raise environmental awareness. 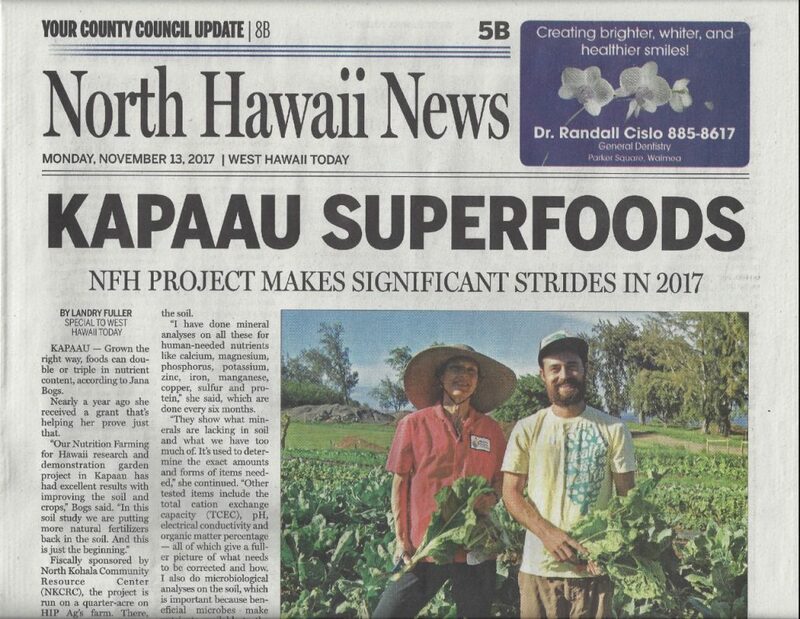 The NFH project is led by Dr. Jana Bogs (PhD Horticulture and Food Science) in collaboration with Hawaii Institute for Pacific Agriculture (HIP Ag) who provide land and much labor in-kind. 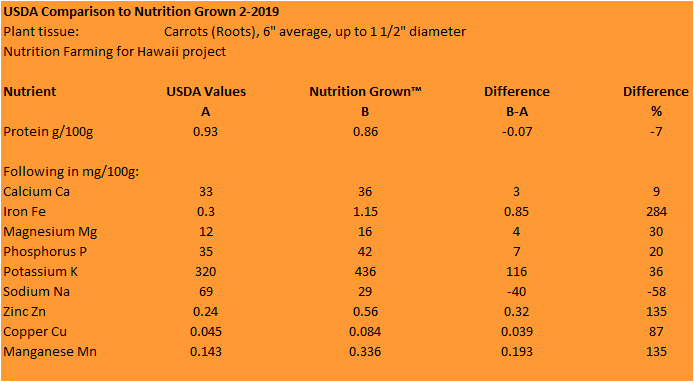 Dr. Hector Valenzuela, a full professor and Hawaii statewide Vegetable Crops Extension Specialist at the University of Hawaii at Manoa, is in the role of advisor. We did not receive full funding this past year, however we carried on the best we could. 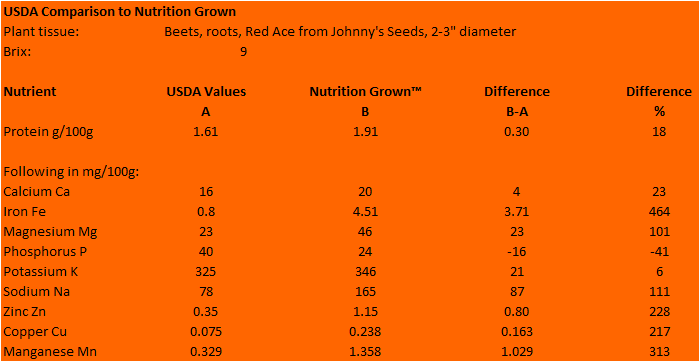 The soil was re-analyzed with a Nutrition Grown™ soil analysis and a soil microbial analysis. Amendments, fertilizers, and microbial inoculants were added. 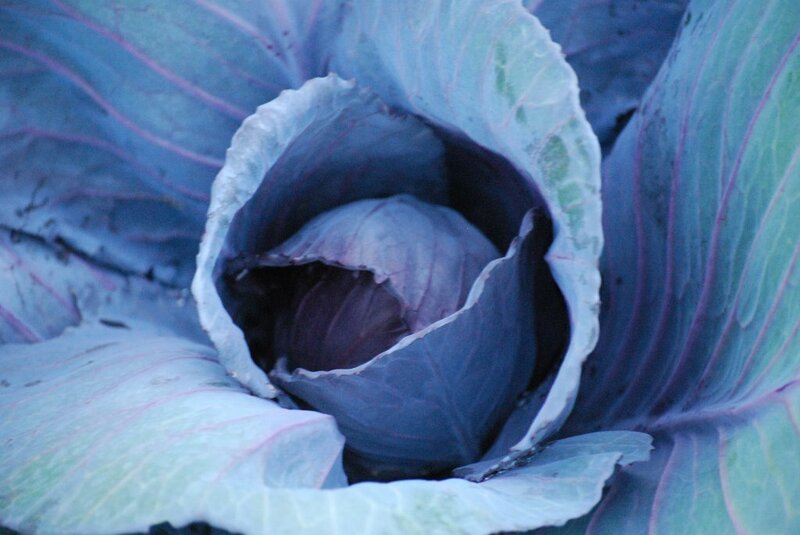 Many varieties of garden crops were planted throughout the year, including lettuces, kales, collards, carrots, taro, bok choy, chard, green onions, and various herbs. 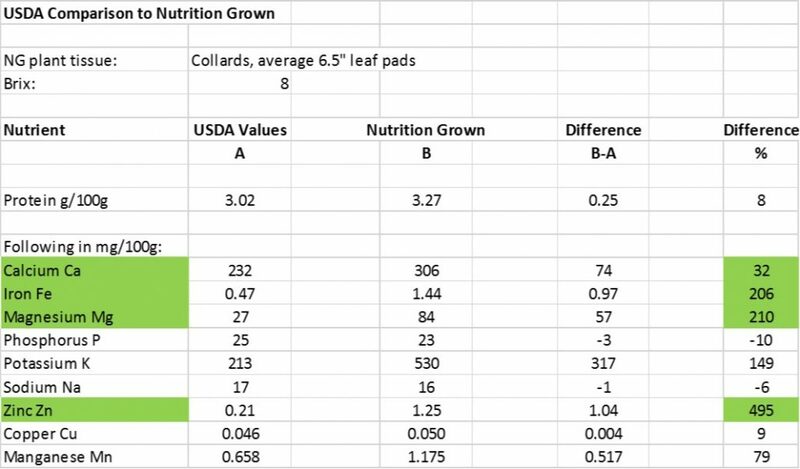 Plant tissue analyses were performed and used to determine the best foliar nutrient sprays to be applied. 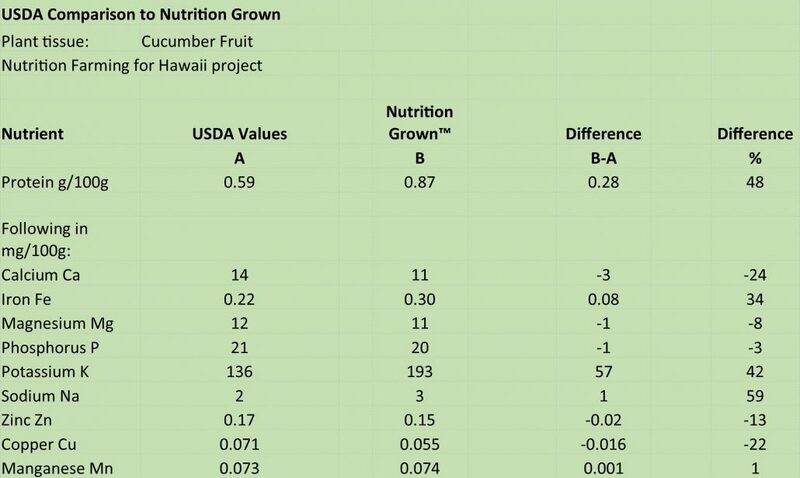 Testing of the nutrient content of the final food products was also done throughout the year, and the values were compared to the USDA Food Nutrient Database values (12 comparisons). We also continued our educational outreach program detailed in the next section. 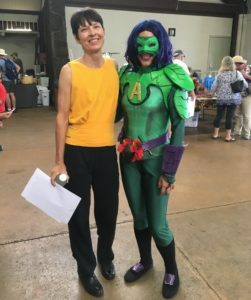 Over 400 school children and numerous interns with the Hawaii Institute for Pacific Agriculture (HIP Ag) visited and learned from the garden. They also got to enjoy eating the food produced there. Unlike the previous year, we had little press coverage this year. The newspapers suddenly seem to require us to spend advertising dollars with them in order to be able to place an article. Therefore we shifted our focus to share our progress throughout the year mainly through live presentations and agricultural event booths. Dr. Bogs was invited to speak (and did!) 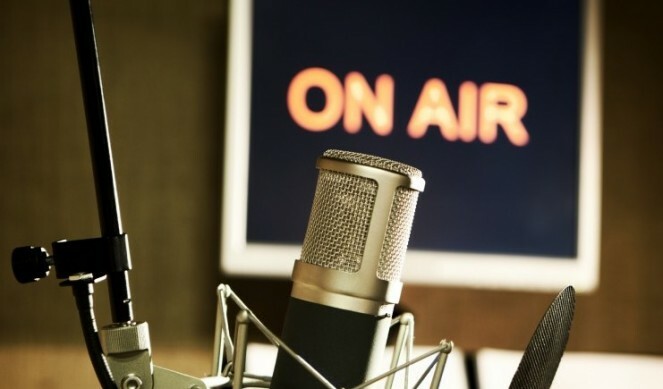 at several venues including Good Intentions Radio and Kauai Community Radio’s In the Garden On the Farm Show in May, the Kona Public Library in June, Dragonfly Ranch in Honaunau in December, the Avocado Festival in Kona in February, and the Hawaii Farmers Union United Kohala Chapter meeting in Hawi in March. 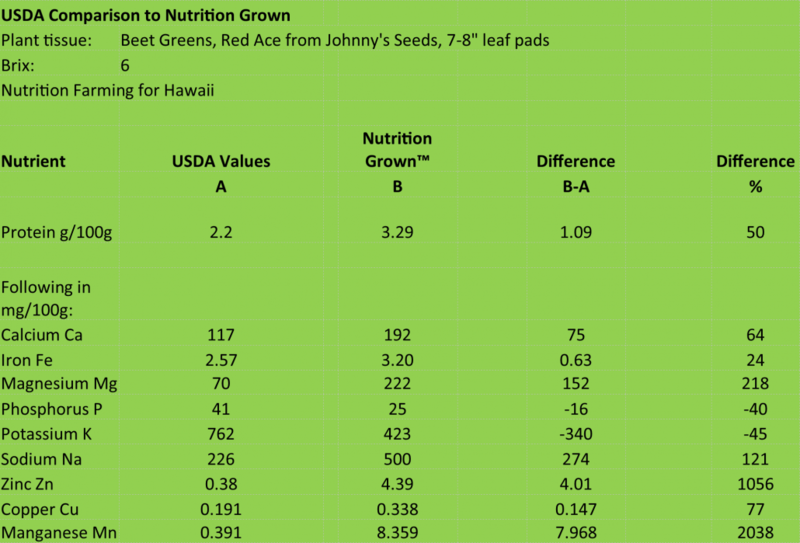 Nutrition Farming for Hawaii gained attention around the Big Island at numerous agricultural event booths including the Mango Festival in Kona in July, the New Farmer Expo in Hilo in August, the Taste of the Hawaiian Range in Kamuela in September, the well-attended `Aina Fest in Hawi in November, the Nuts Festival in Kona in November, and the Avocado Festival in Kona in February. We did, as many farmers do, have challenges with weather and labor. The volcano surprised us all by spewing lava and vog for months. We also had hurricane after hurricane dumping huge amounts of water on the field which leached minerals and slowed progress. The soil samples were sometimes more like “mud samples”. 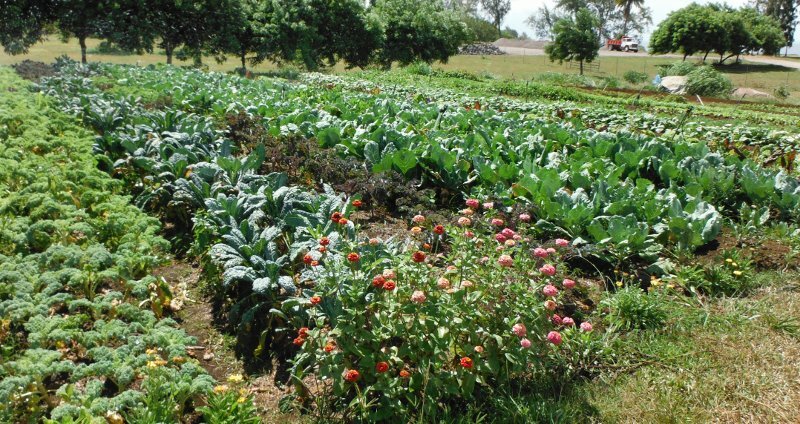 We did, however, persevere and did produce crops which did feed the community, including local school children. Keeping a steady supply of labor willing to deal with the adverse conditions was a challenge. Implementing weed barrier cloth over most of the garden soil controlled the weeds, saved labor, and made working conditions less muddy and much more pleasant. Obtaining a larger, more efficient sprayer for applying microbes and foliar sprays also saved a lot of labor. Future plans include continuing our work with improving soil and crops, and documenting that. We also plan to do continue outreach with our interesting data. We would like to survey the community to obtain market data, which can be important for encouraging other farms to implement similar programs. People are asking where they can buy this quality produce, and we would love to be able to hand them a list of farmers and markets where it would be available for purchase. Implementing an online training course with a hands-on component for farmers and gardeners will be the next step to bring this better quality food to more people’s dinner plates. It is with much heart-felt gratitude that we thank our granting foundations for funding our project in 2018-19. 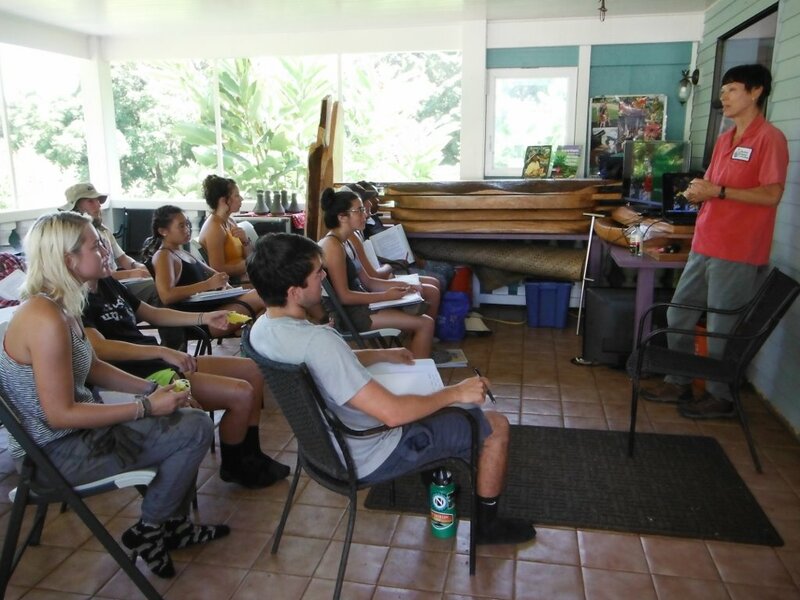 We also thank our fiscal sponsor, the North Kohala Community Resource Center, a 501(c)3 non-profit organization, for helping us through the process of grant-finding and administration. We are seeking more funding for 2019 and beyond to continue our work. If you love what we are doing, please consider a tax-deductible donation of any amount–click here.